August 15th The Lion King comes out on Blu-Ray! This is one of my favorite movies! Not only was it one of my favorite movies from my childhood, but it’s one of my favorites to enjoy and watch with my daughter. Pumba is a character that always makes my daughter laugh, and she likes that she can see him in The Lion King and when she watches The Lion Guard on Disney Junior. To celebrate the Blu-Ray re-release, I created these healthy, vegan Pumba cookies inspired by everyone’s favorite warthog. 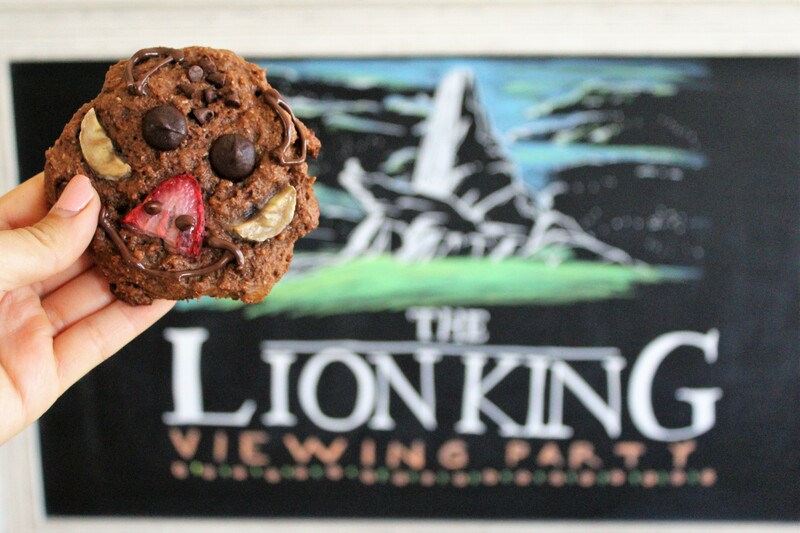 These cookies were part of my Lion King viewing party I recently set up! You can view the whole party here. In a large bowl, whisk together your flour, baking powder, salt, and coco powder. In a separate bowl, mash a ripe banana. Then add in maple syrup and vanilla extract, combining. Add your wet ingredients to your dry ingredients and combine well. Place 2 Tbsp of dough for each cookie on a cookie sheet lined with parchment paper, flattening each mound of dough with the back of a large spoon. Cut small, triangular slivers of strawberries, placing them on top of each cookie for Pumba’s nose. Cut 8 slices of banana. Cut each of the slices in half, placing them on either side of his nose to be Pumba’s tusks. Place two dark chocolate chips for Pumba’s eyes. Place mini dark chocolate chips on top of Pumba’s head to be his hair. While you wait for your cookies to cool, melt some more dark chocolate chips with oil in a dish, and then place in a piping bag with a small, round tip. Pipe on a smile for Pumba, two dots on his nose, and pipe on ears.